Oddly there is a nomination here that has had little to do with sportscar racing for a decade, the naming of Alex Zanardi though was one with which we all agreed – Racing is the richer for his presence. Kazumichi Goh’s efforts to put life back into the international aspirations of Japanese sportscar racing was another effort that quite correctly garnered praise. From the ranks of gentleman racers one name often crops up as being a true embodiment of the term. Always ready with advice, contacts, and encouragement. Mauro Caseidi gets a deserved vote here. From the realm of national racing comes a man who famously drives anything, and always drives it very quickly indeed. Whether it was the F1 cars he pedaled in the BOSS series, through a multitude of GT and sportscars he is rightly regarded as one of the quickest (and most infectiously cheerful) men around. The story of Martin Short’s racing career would make a great novel – Only most readers would regard it as a fantasy. From the club racing through one make Rover and TVR campaigns and then into the sportscar racing ranks – A self built TVR Cerbera, the early development of the Tuscan R and then the Mosler project and the brave attempt to bring the Noble marque into frontline national GT racing. Latterly of course the brave and successful project to bring his beloved Dallaras back to the fore, a campaign which, if things had been a little different could have resulted in the title for his Rollcentre squad. His campaign in 2006 with the Radical SR9 shows once again that Short defies the obvious and the fans love him for it. What more can be said about the team that Mike Jankowski and Ian Bickerton brought out to play? From the Lister Storms they battled away with in the FIA GT Championship through to the DBA they have battled away to develop into a race winner. With plans for an expanded campaign still very much on the cards for 2006 their position as a fan favourite will only be strengthened. And who would now bet against them scoring that first win (and perhaps more!)? The winner here though is a man that, It must be said, has sometimes had something of a reputation for being less than a ray of sunshine. In 2005 though he made a very brave attempt indeed at grabbing the crown at Le Mans in what might prove to have been a tiny window of opportunity to exploit the hybrid regulations. It so nearly paid off and indeed netted him the LMES LMP1 crown, but there is no doubt whatsoever that the real game was Le Mans and not only did the lead car come close to winning the race, the second car grabbed enormous attention through the appearance of the World Rally Champion Sebastien Loeb on the driving squad. What impressed several of our panel most of all was that when the race was over and the Champion Audi had won, our winner showed himself to be the consummate sportsman. Outwardly cheerful in defeat and talking immediately of trying again in 2006, his throw of the dice gave us a real race long contest for the win which was not Audi vs Audi. And, who knows, with an as yet unproven R10 and Zyteks running to hybrid regulations for the first time in 2006, he might just have another reasonable shot at it this year too. 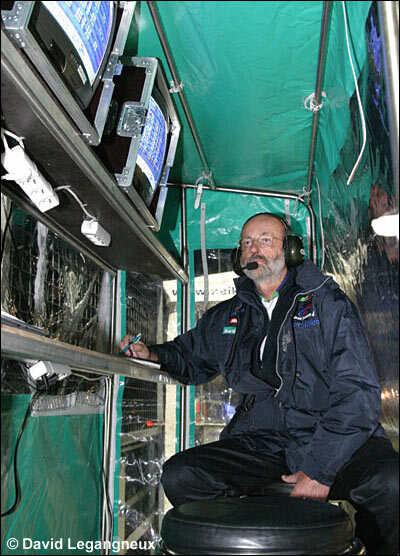 dailysportscar.com’s 2005 European Award for the Spirit of Racing goes to Henri Pescarolo.